Eastleigh have announced that 32-year-old goalkeeper Ross Flitney has left the club by mutual consent. Ryan Clarke joined the Spitfires last week from AFC Wimbledon and made an immediate impression on his debut helping Eastleigh to a 2-1 win over Sutton United. Flitney wasn't in the match day squad at the weekend having lost his place as number one. 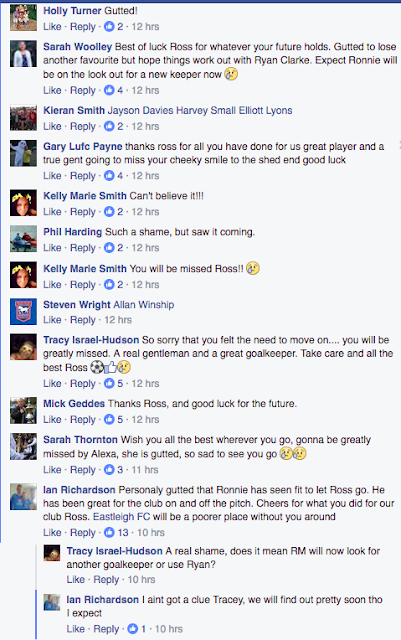 Flitney will always be remembered fondly at the club having been the goalkeeper who helped Richard Hill's Eastleigh win promotion from the Conference South as champions. Ross initially joined from Gillingham on loan in October 2012 and has been with the club for the best part of four years. Eastleigh's next home game on Tuesday 4th October v Maidstone United (19:45 kick off at the Silverlake Stadium) is free entry for everyone! Take advantage of this generous offer from the club and get behind Ronnie Moore's in-form Spitfires. Eastleigh chairman Stewart Donald said: "Tuesday 4th October at Home to Maidstone has been designated as our free game this season. "Every time we have done a free game we have managed to attract new fans who have gone on to become regulars and season ticket holders. "Every attendance has also increased, so please spread the word and help us get as many new faces down the Silverlake as possible as we look to add to the Spitfire family. "Season tickets are still going well and we are approaching 1200. Moore: "One of the best goalkeeping displays I have ever seen"
Eastleigh boss Ronnie Moore was delighted with the debut of goalkeeper Ryan Clarke, who played a vital role in helping the Spitfires secure a 2-1 victory over Sutton United, keeping the impressive run of form going in the process. Clarke, who signed from AFC Wimbledon, made some crucial saves in the second half, none more so than keeping out a late penalty which could have seen Sutton level. Moore described Clarke's performance as “one of the best goalkeeping displays I have ever seen." “But for the keeper, we lose the game, no doubt about it. He’ll be disappointed with the one he let in, but the saves he made were fantastic. Eastleigh made it eight games unbeaten and are yet to lose a game under the leadership of boss Ronnie Moore and his assistant Kevin Watson. Goalkeeper Ryan Clarke had a debut to remember as he made save after save and crucially kept out a late Sutton penalty to ensure Eastleigh held on to all three points. The Spitfires went 2-0 up early in the second half as Luke Coulson popped up with two goals in as many minutes. It was his third goal in two games as Coulson also netted the winner in Eastleigh's last game away at Macclesfield. The visitors pulled a goal back to set up a tense finale with a strike from Ross Stearn. As Sutton increased the pressure they won a penalty and the chance to level the game late on and take a point. Ryan Clarke, whose performance in goal for Eastleigh was hailed as "one of the best goalkeeping displays" that his boss Ronnie Moore had ever seen, made an excellent stop to deny Sutton a share of the spoils to keep out Gomis' spot kick. 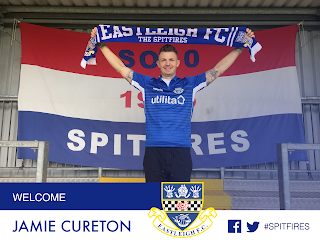 Eastleigh have completed the signing of veteran striker Jamie Cureton. Cureton has a wealth of experience having played over 750 professional games, with a goal-scoring tally of more than 250. Jamie, 41, was playing and scoring goals in League Two only last season with Dagenham & Redbridge. The former Norwich, Bristol Rovers, Reading and QPR striker has been prolific over the course of his career and will be looking to add to the attacking options for Ronnie Moore's Spitfires. He will join a pool of strikers which include this season's top goalscorer Mikael Mandron, last season's top scorer James Constable along with the recently signed Ryan Bird and summer signing Scott Wilson, who is currently injured. Cureton spoke of his delight upon signing for Eastleigh: “I am delighted to be joining Eastleigh.
.@eastleighfc announce that defender @AyoObileye has joined @DoverAthletic on a 2-month loan. 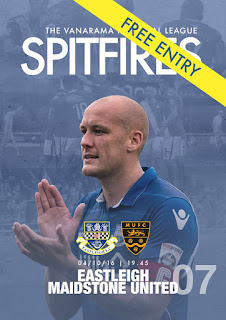 He has yet to feature in VNL for #spitfires. https://t.co/kPbKcxS4WJ — Jamie Montigue (@jamiemontigue) September 21, 2016 Eastleigh Football Club can today confirm that Ayo Obileye has joined Dover Athletic on a 2-month loan. Having joined the Spitfires this summer, Ayo has since yet to feature in a league game, so has joined the Kent based side to gain valuable playing time. Eastleigh do have the option of a 24-hour recall once 28 days has passed in his loan agreement. We wish Ayo the best of luck whilst out on loan. Eastleigh progressed to the next round of the Hampshire Senior Cup with a 2-1 win at Alresford Town. A young Spitfires side that included nine scholars and 3 scholarship graduates, was bolstered by four senior pros as Ayo Obileye, David Pipe, Adam Dawson and Jai Reason all started in the victory. Experienced goalkeeper Ryan Clarke has become Ronnie Moore's first signing since taking charge at Eastleigh. The 34-year-old shot-stopper has joined from League One side AFC Wimbledon on a contract until the end of the 2017/18 season. Clarke has made in excess of 450 appearances including over 200 games for Oxford United between 2009 and 2015. Clarke's arrival will now add increased competition to Ross Flitney and Ryan Huddart for a place in between the sticks. Commenting on signing for the Spitfires, Clake said: “The move has come about very quickly but I am very excited about it and can’t wait to get started. "Knowing what the club are trying to achieve, with the squad that has been put together and the people that are here in charge it made it an easy decision for me to come. In a week where Eastleigh faced two stern away tests against Forest Green and Macclesfield, Ronnie Moore's Spitfires continued their excellent form to rise to sixth in the Vanarama National League. Eastleigh's unbeaten run continues under the leadership of Moore and assistant manager Kevin Watson, with a 1-0 win on the road. On the back of a valuable point away at 2nd-placed Forest Green on Tuesday night, Eastleigh should be more than satisfied with an excellent four-point haul for the week from two tough away fixtures. The Spitfires are top of the form table as a result of securing a seventh consecutive game unbeaten. It is also five clean sheets from seven since Moore arrived at the Silverlake Stadium. Luke Coulson netted the only goal of the game in the 50th minute to secure a big three points at Macclesfield and keep Eastleigh rising up the table. Eastleigh boss Ronnie Moore reacts to the 1-0 win over Macclesfield. Describing Luke Coulson's goal, Moore said: “It was a great ball in to be fair. Greener’s picked him out from nowhere and it was a great finish from Coulson, who is looking nice and sharp. “We had another couple of chances and, with a bit of composure in and around the area, we might have had a second. “We didn’t play half as well today as we did at Forest Green, but we still had enough guile and determination to go and win the game. “It’s unbelievable how gaps can close. We’re now looking back and thinking ‘if only’ – Southport (a home draw) being the one – if only! “But if onlys get you nothing and we’ve just got to keep playing as we are and keep believing. Eastleigh boss Ronnie Moore previews the Spitfires' upcoming fixture away at fifth-placed Macclesfield. Eastleigh drew 1-1 at Forest Green on Tuesday night, but lost Andy Drury to injury. This could open up an opportunity for Jai Reason to play at the weekend. Moore said: “Dukes’ (Drury’s) injury’s a nasty one. He’s got eight or nine stitches, maybe more, and they’ve got to stay in for ten days. “It’s caused us a bit of a problem because the lad goes forward and attacks and he’s got a good understanding in there with Tayls (Jason Taylor). “We’ve got Tayls and Pipe who sit in, but we’re short of an attack-minded midfielder. “But Jai Reason’s still here with us and he'll travel." "I’ll always listen if someone wants to take a player, I don’t care who it is. It’s about the club, not individuals. I was Rotherham manager for eight years and I still got the sack! Ronnie Moore's reaction to the 1-1 draw away at Forest Green. Speaking of an injury picked up by midfielder Andy Drury, the Eastleigh boss said: “It was a nasty tackle on Drury, he’s definitely left his foot in the and the assistant [manager] was lacking in top professionalism. It was like the Dog and Duck and the officials dealt with it properly. “I thought we were terrific. They’re as good as any side in this league but we more than held our own, we put them under pressure and counter-attacked so well at times. “We weren’t happy with a draw on Saturday but we’re happy with this because we won’t play better sides than them in this league. “Overall it’s a terrific performance but they’re in there with their heads down which is good for me. Eastleigh secured a 1-1 draw away at Forest Green Rovers backed by excellent support with three coaches full of fans travelling to support the Spitfires. Mikael Mandron put Ronnie Moore's side 1-0 up early in the second half, his fifth goal in four games, but Eastleigh were pegged back just eight minutes later. Rhys Murphy with the equaliser for the hosts and it finished all square. The Spitfires are now unbeaten in six games after taking a valuable away point at the division's second-placed side. "The 36-year-old midfielder and the club have reached an agreement to cancel the midfielder’s deal. Ben leaves 3 years after joining the club." Chairman Stewart Donald commented “Ben has been a superb servant and ambassador of the football club since arriving. "He was an instrumental part of our championship winning side that secured promotion from the Conference South. We thank Ben for everything he has done in his time at the club. Lee Peacock's youthful Wyvern League Reserve side took on Brockenhurst Reserves at the Silverlake stadium on Monday night in the Wyvern League Challenge Cup 1st Round. Eastleigh Line up: 1 Mark Childs (C), 2 Charlie Daniel, 3 Jake Randell, 4 Ollie Griggs, 5 Lewis Harvey, 6 James Parker-Trott, 7 Bradley Raymond, 8 Dylan Kirkwood, 9 Marcus Laptas, 10 Tom Bearwish, 11 Jordan Beeke. Subs: 14 Brandon Hamerston and 16 Lee Peacock. Eastleigh's young guns made a bright start and were soon on top. They took the lead with a smart finish from Tom Bearwish on 6 minutes following good work from Bradley Raymond. Left winger Jordan Beeke had a good run and shot saved well by the Brockenhurst goalkeeper on 8 minutes. It wasn't long before Eastleigh were further in front with man of the match Bearwish doubling his own and Eastleigh's lead converting a cross from Beeke. Eastleigh continued to dominate the first half and indeed finished the half with two consecutive corners. Moore: "We've got a massive week ahead"
Ronnie Moore reacts to the 1-1 draw at home v Southport. On Eastleigh's opponents, the boss said: "They train Tuesday and Thursdays, whereas we’re full-time. We’re in every day, we’re working and, by rights, we should be running the legs off teams like Southport. “No disrespect to them, but we shouldn’t be allowing them to be in the game. “But everything you think about and talk about we did wrong today. “We were lucky we weren’t playing one of the top sides because we probably would have lost. “We never got started today. We just thought we’ll turn up and we’re going to win the game. “Really they’ve done nothing to us and we’ve come off level. “To me it feels like a defeat. “Alright, we’ve got a point, but if we’re going to get out of this league we’ve got to be beating Southport. “We’d drilled it into them all week to start well and get on the front foot. “You can blame the rain, but there was no wind today. There’s no excuse for them. A winning run of three games came to a halt for Eastleigh as they drew 1-1 at home against Southport. The Spitfires are now unbeaten in five games but couldn't hold out for a win as Mikael Mandron's opener was cancelled out by James Gray. Eastleigh: Ross Flitney, Joe Partington, Michael Green, Andy Drury, Ryan Cresswell, Reda Johnson, Adam Dawson (Luke Coulson, 74), Jason Taylor, James Constable (Ryan Bird, 82), Mikael Mandron, Jake Howells. Subs: (not used) Ryan Huddart., Adam Dugdale, David Pipe. Southport: Tyrell Belford, Neil Ashton (Ross White, 81), Liam Nolan, Josh Thompson, Louis Almond, John Cofie (James Gray, 70), Andrai Jones (James Caton, 63), Gary Jones, Craig Stanley, Callum Howe, Mark O’Brien. Subs: (not used) Jamie Allen, Connor McCarthy. Yemi Odubade has departed Eastleigh FC by mutual consent. The popular striker has moved on from the Spitfires after 3 years with the club. Yemi scored 7 goals in 35 games in his first campaign for the club to help the club secure promotion from the Conference South as Champions in the 2013/2014 season. In total Odubade, who joined Eastleigh from Gateshead, made 136 appearances scoring 22 times in the blue of Eastleigh. We wish Yemi all the best for the future and thank him for his service to the club. Pictured below: Odubade celebrating scoring v Basingstoke in April 2014, the game that sealed Eastleigh's promotion to the Conference Premier. Generous Eastleigh applauded for putting fans firstEASTLEIGH are putting fans first by laying on two free coaches to next Tuesday's big Vanarama National League game at table-topping Forest Green Rovers. The Spitfires' players got the ball rolling by offering to club together financially and pay for one coachload of supporters to make the trip to Nailsworth, Gloucestershire and cheer on the boys in blue. The Spitfires sealed their third win in just eight days on Non-League Day to maintain their 100% winning start under Ronnie Moore. Written by Jamie Montigue. On the back of the excellent 5-0 thrashing at Bromley, Moore made two changes to his starting eleven. 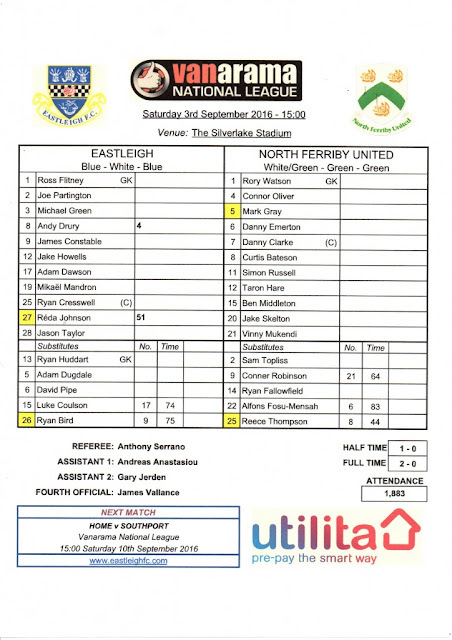 Joe Partington returned at right-back in place of Connor Essam and Reda Johnson returned to partner Ryan Cresswell in the centre of defence in favour of Adam Dugdale. Cresswell led the team as captain despite Partington's welcome return from injury. Andy Drury got Eastleigh off to a flying start with a 3rd minute header. Tricky winger Adam Dawson, who created two goals and scored one himself at Bromley, laid on the assist for Drury's third goal of the season. Powerful centre-back Reda Johnson, described by Ryan Cresswell as a "man-mountain", doubled Eastleigh's advantage early in the second half.